AP/ J. Scott ApplewhiteSen. John McCain (R-Arizona). Sen. John McCain (R-Arizona) has a simple response to those who accuse him of always advocating for war: Tell me when I’ve been wrong. 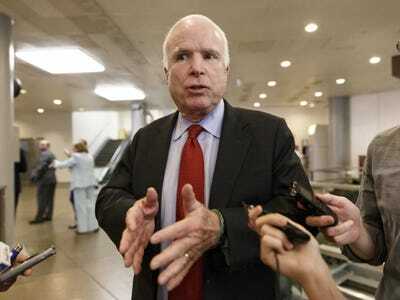 During a WNYC radio interview promoting his new book, “Thirteen Soldiers,” on Tuesday, McCain was pressed by a caller on his hawkish foreign policy views. “It seems to me whenever our country is faced with a situation of going into war [or] not going into war, you seem to be one of the first and loudest voices for for taking a position of going into war,” the caller said. The caller further said McCain’s own history as a decorated veteran should have made him less eager to use US military force abroad. “And it seems ironic to me that a man that has been through so much, seen so closely the horrors, … that you would take that position,” added the caller. McCain went on to list a series of international crises he said were the result of President Barack Obama’s unwillingness to project strength overseas. “We are now facing a direct threat to the United States of America. It didn’t have to happen. It’s not like hurricanes or earthquakes. It was not an act of God. It was a failed, feckless foreign policy. We are watching Ukraine being dismembered by Vladimir Putin. We are seeing the aggressive China in the Far East. We are seeing the least United States influence than anytime in my lifetime and lots of bad people are taking advantage of it,” he said. However, McCain said his foreign policy views were at least partially vindicated by his staunch support for the 2007 surge of US forces in Iraq. He claimed this proved his views on the situation there were prescient.